Yes, I'm finally updating this blog, but only to shut it down. You see, it's not just me anymore. I am now part of an "us" and we are usually up to something together. 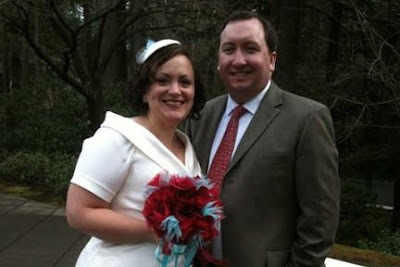 So it seemed fitting to start a new blog full of the musings and adventures of Richie AND Amber. Visit our new blog here. I regularly walk through my neighborhood and the other day I saw this amazing flower. I have never seen anything like it. I'm not sure what it is, but I think it's one of the most beautiful flowers I've ever seen. In August, Richie and I took a long trip up the coast to visit our families and take a little vacation. We had a great time and we learned that we like each other quite a bit. 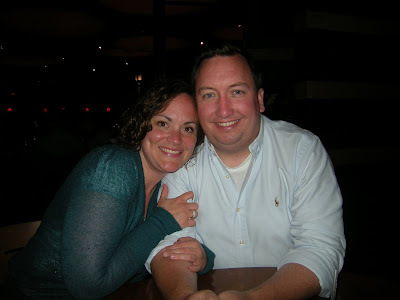 In case the news hasn't spread to everyone who reads this blog, we're engaged! We left for our trip up the coast and headed up scenic Highway 101. We found a lovely little beach town that we'd like to visit again someday. 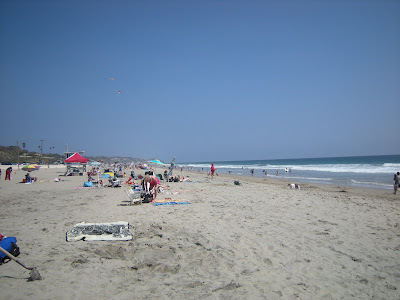 Avila Beach is a cute little town that looks like a great place to spend the weekend. After a quick stop, we were on our way. After a brief stop at Richie's parents' house in Fremont, CA we were headed up to Oregon. (Don't worry; we stopped there and spent some quality time with his family on the way back.) Our first stop was Ashland, OR where Richie lived when he was in grade school. It was fun to see the house he lived in and the old places he used to frequent. Ashland is a great town with a cute old shopping district. It is most famous, however, for it's annual Shakespeare Festival, and while we were there, we got to see Cervantes's Don Quixote. It was a marvelous production and we had perhaps some of the best seats in the house - 3rd row center. The play was performed on the Elizabethan Stage, the first of such outdoor theaters in the US. It was the perfect night for an outdoor performance and I hope to visit Ashland again someday. When we arrived in Oregon we spent some time at my parents' house and they spent some time getting to know Richie. My mom says that the first time she met him, she already liked him. I think everyone got along quite well. I took Richie into downtown Portland and we visited some of my favorite spots. It was a beautiful night to walk along the waterfront and show him the city I love. After some Portland time we headed to the beach. Of course we had to spend time at my favorite place in the world. I love the Oregon coast and I wanted to show Richie why I loved it so much. We had perfect weather the entire time and enjoyed a relaxing visit. Margaret enjoying an afternoon on the beach. Andrew, Linda, Savannah, Margaret and LeGrande all came to the beach to visit. It was great to see everyone. The kids are getting so big! We visited Richie's family in Fremont, CA next and enjoyed many beautiful spots in the Bay area. I regret not taking more pictures during our stay here, but I did get some good shots of our trip into San Francisco. We also visited Palo Alto, the Stanford campus, won lottery tickets to see the play Wicked and had some good family time. Richie's family is wonderful and I'm looking forward to getting to know them better. They are warm, unassuming, generous, hilarious and just fun to be with. I felt right at home in their house and I'm grateful for their hospitality. Here are some shots from San Francisco, mostly at Pier 39. It was a beautiful breezy and I ate soup in a warm sourdough bread bowl on the pier. We also saw the largest group of sea lions I've ever seen. They were especially smelly and quite mean to each other. But I did enjoy them posturing for a good spot on the deck. The last leg of our trip was perhaps the most memorable. As I posted previously, we camped in Monteray and visited Carmel before driving through Big Sur. We had a brilliant day finished off by a stunning sunset along the coast. We stopped at several view points along the way and enjoyed the beautiful scenery. I came to find out later that Richie had hoped to propose at one of these lovely spots. But it wasn't meant to be. Our privacy was constantly inturrupted by other travelers who also wished to enjoy the view. There was still time left in the evening and there would be other spots along the way, Richie thought. (I was unaware at this point.) We continued to drive when it became clear that our car was overheating. We were forced to stop on the side of the road while this car that had been so faithful to us throughout the entire trip took a much needed break. After cooling down, we were able to pull into a gas station. I ate a dinner of convenience store nachos on the curb while Richie burried his head under the hood, trying to determine the problem. The town we landed in was very small and neither of us had cell reception. We made friends with some people at the gas station who tried to diagnose our problem. We then decided to have the car towed and stay in the small town of Cambria for the night. We later learned that the car's water pump was faulty and needed to be replalced. The tow truck driver, an experienced surfer named Brett, picked us up and took us to a hotel where we would stay until we could get our car fixed. Once we got settled in our room, we were very tired and glad to rest for a bit. Durring the whole ordeal, Richie seemed especially anxious and stressed. He had planned on a romantic proposal but our story was meant to be unique and a bit adventurous. As we were settling in, Richie got on one knee and asked me to marry him. It wasn't exactly what he had planned, but he knew he wanted to ask me. I think the fact that I didn't get upset about the car breaking down may have sealed the deal for him. I of course said YES. Here we are after a long day of sight seeing, an exciting evening of car difficulties, and, of course the exciting event of getting engaged. We were tired, but very happy. Richie and I are on our way home to LA after a wonderful trip. I'll post more pictures when we get home, but I thought I'd share a few from our beautiful drive. We're stopped for a quick vehicle tune up which gives me a chance to post some pictures of the amazing drive from Carmel to Big Sur. It's been a near perfect day. Pancakes and eggs for breakfast, made on the campfire. The Monteray Museum of Art. Yummy lunch in Carmel. A stunning day on the beach. A tour of the Carmel Mission. Breathtaking views of the Pacific coast around every corner. is the reason why I went to LA. He's also the reason why I'm now in LA, at least for the summer. It's beautiful and sunny and I can go to the beach often. I'm still loving California, and even though it's hot, I don't mind. It cools down at night and there are farmers' markets everywhere. It's my kind of place. Fortunately my work has allowed me to work remotely and I was able to rent out my condo. So far this summer has been fabulous. I took a fun trip to LA at the end of May and absolutely loved it. To be honest, I didn't think southern California would be for me, but it turns out that I kind of love it there. 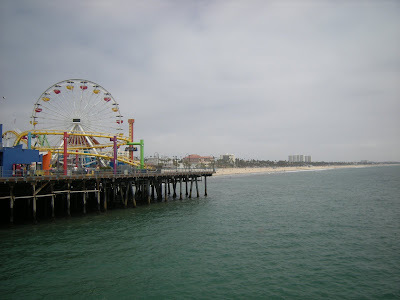 I went to Santa Monica and its famous pier, hit the beach in Malibu, loved every minute in Santa Barbara, saw the pre-Broadway play Dirty Dancing, bought fabulous produce at a local farmers' market, saw some great places in LA and left wanting to come back. The Santa Monica Pier is every bit as exciting as I thought it would be. Lots of people, fun rides, people fishing, the salty smell of the ocean and an exciting energy that I loved. 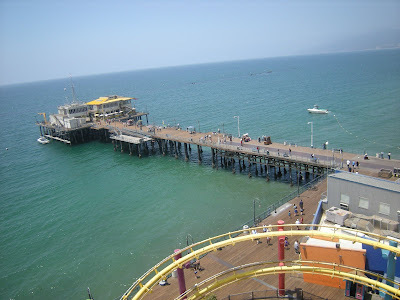 Here's a view of the pier from the top of the Ferris Wheel. Maybe carnival rides are cheesy but I love them. I make no apologies for wanting to play like a kid on a beautiful day at the ocean. 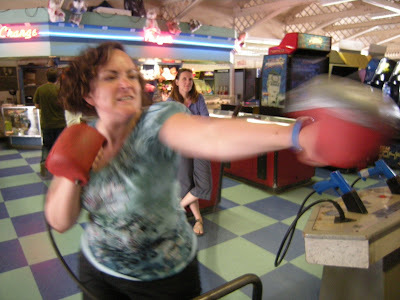 There was a boxing game in the pier arcade that I had to try out. I made it all the way to level 3. All those years of boxing classes finally paid off. The beach in Malibu is beautiful but full of people. It is a little different from the beaches I'm used to in Oregon but beautiful all the same. 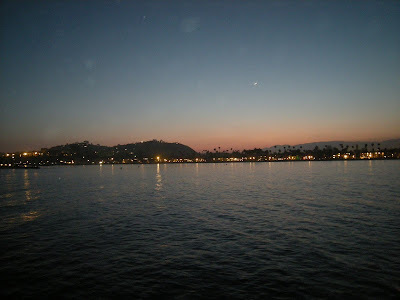 Santa Barbara was probably my favorite place I visited on my trip. Unfortunately I don't have a lot of good pictures of this beautiful town. It's a beautiful area with fun shops, lovely scenery and cool architecture. 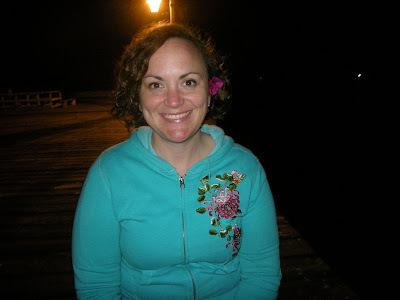 Here are some pictures of me on the pier at sunset.